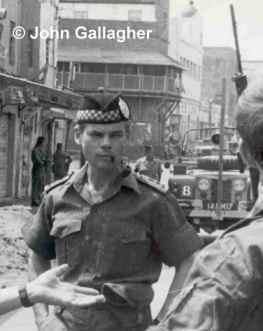 I come from Glasgow and at that time there was a lot of gang trouble in the city so I joined the 1st Battalion Argyll and Sutherland Highlanders for a bit of peace! I joined the Battalion in Crater in August and was put straight in at the deep end with 16 Platoon Support Company at the position overlooking the police station. They were a great bunch of lads and had the highest terrorist kill rate in the Battalion. I was the youngest member of the platoon and maybe it was because it was my first time in action that I was more wide-eyed than the others, many of whom had already seen action in Borneo. I remember on one funny occasion, and this is my first admission, when doing barrack room soldiering you always stood cigarettes on their end to stop anything being burnt. I was called on stag and as I was lacing up my boots I had my last fag and stood it on its end. I got up to leave the room about 2am thinking it had turned more humid than usual and turned on the fan to cool down Lenny Sansome, lying on the bed. I went up the ladders to the top of the roof. After about 10mins I smelt burning, and I went down to discover that the fan had blown the fag end into a corner with some old rags and started to burn the place down. I raised the alarm and ran into the room and Lenny was there with his bed on fire. I got a fair amount of praise and Lenny got his head chewed off for smoking in bed. To this day I've said nothing about this. No way am I going to admit to that. I still chuckle yet. Incidentally, Lenny Sansome was the man who had the first bayonet kill since Korea during the Battalion's tour of Aden. Afterwards they took the bayonet from us. On the evening of the 22nd a patrol from D Company, moving down an alley off Zafaran Road, stopped to question an Arab who was acting suspiciously. The Arab panicked and tried to grab one of the Argyll's rifles. Both men fell to the floor in the struggle. The Argyll, knowing that he could not shoot the Arab in such a confined place without the possibility of hitting one of the patrol as well, took the only other option he had and killed the Arab with his bayonet. This incident was seen as an uncalled for use of brutality by the higher authorities and new orders were delivered to the Battalion saying that bayonets were no longer allowed to be taken on patrols! The Argylls felt as though their hands were being tied behind their backs. It was a whole new experience for me. Sergeant John Cree, who sadly died recently, took me under his wing. 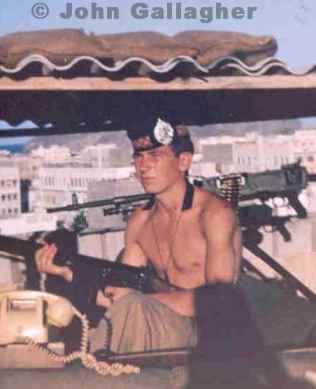 On one occasion we were setting up an 81mm mortar on the roof aimed at the Arab police barracks. If you know about 81s, we would have got one round off before the whole roof collapsed. Crazy looking back but at the time it seemed a good idea. Mr. Watson was the platoon officer and he was later killed on my last tour in South Armagh. 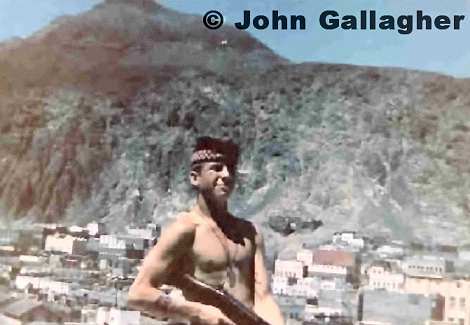 On the 7th of November 1967, (the saying was "days to do are getting few") the atmosphere was quite tense FLOSY and the NLF were doing their own interfactional fighting in other parts of Aden. As we all knew within a short time the Argylls and the Brits would be pulling out to leave them to get on with it. We were also actually aware that none of the terrorists would be brought to British justice - in fact they would be heroes. The previous day a grenade was thrown at the CO's car adding to the tension so we were at a high state of readiness. Our patrol, commanded by Lt. Watson, came across a white Volvo packed with Arabs. This was very unusual and would have been suspicious under any circumstances. Seeing us, and knowing our strict stop and search policy, they panicked leaping out of the vehicle and firing at the same time. They were immediately engaged by the patrol and taking up firing positions they were determined to fight it out with us. A vicious gun battle ensued in which all four terrorists were killed. As it turned out they were in the process of kidnapping a Shell Oil Company worker who was extremely relieved to see us, as you can imagine. 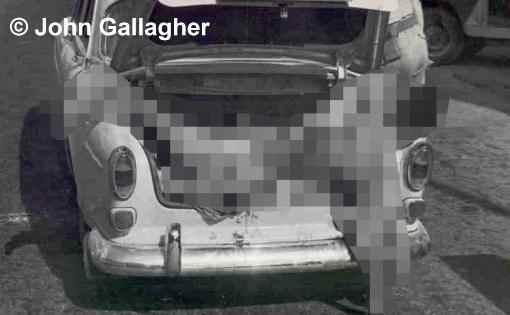 We recovered a grenade and two Czechoslovakian pistols. It was strange, in my young years, to hear on the BBC World Service report at 6 pm that evening stating that a gun battle had occurred between security forces and Arab terrorists and in the ensuing gun battle four Arab terrorists where shot dead. Security forces sustained no losses or wounded. 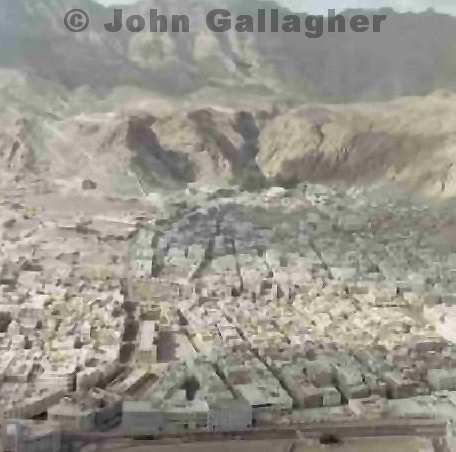 It was typical of the day that the Regiment was not mentioned nor was the ensuing peaceful withdrawal from other parts of Aden. The gun battles we could hear every night did not happen in Crater. Argyll law was firm and there were not many Arab heroes left to brag.